Mike Sigrist has been on quite the tear recently. He just had twin daughters, and he even won player of the year. After a solid Limited performance this weekend, Sigrist is also currently tied for the lead in the race for the Draft Master slot at the world championship after a 3-0 performance this morning. 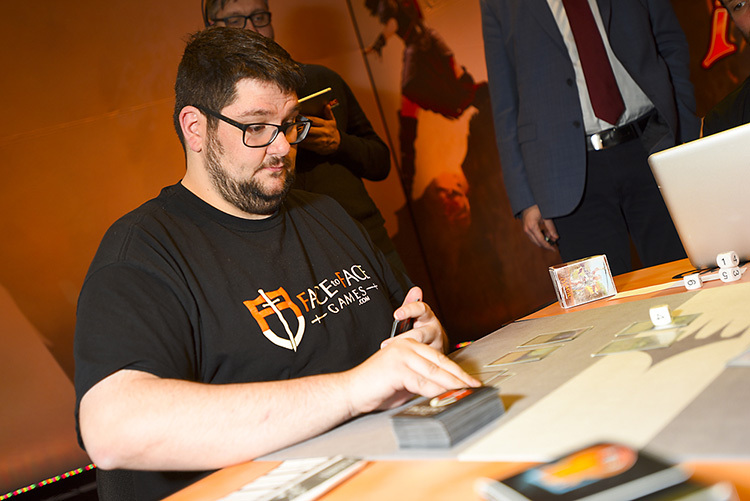 Sigrist already has a pair of Pro Tour Top 8s and three Grand Prix Top 8s to his name, but he'd love to add another Pro Tour Top 8 to his resume this weekend. Sigrist is a member of team Face-to-Face Games, and is playing the team's powerful Eldrazi deck that seems to have caught this tournament completely off guard. 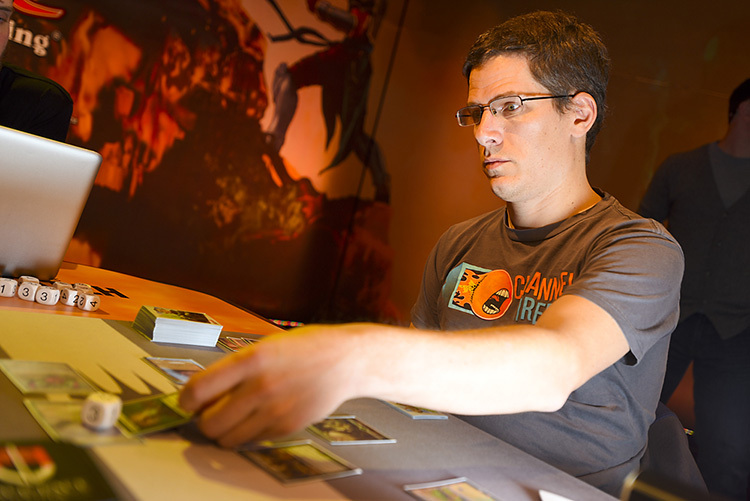 His opponent, Andrew Cuneo, has been an on-and-off Pro Tour regular since the beginning of time. Cuneo also has two Pro Tour Top 8s and three Grand Prix Top 8s. His dry sense of humor and nonchalant evenhandedness make him a favorite among Pro Tour regulars and an enigma to those that haven't had the pleasure of spending a lot of time with him. Cuneo tested with The Pantheon. It's odd to see Cuneo playing with a deck that's not filled with countermagic and card draw, but this weekend he's armed with Infect, a powerful combo strategy that's capable of winning as early as the second turn. The two players discussed life as they shuffled and waited for the match to start. "How old are your kids now?" asked Cuneo. "About six months," replied Sigrist. "So, what do they do at that age? Are they walking or talking or anything like that?" "No, that would be kind of impressive," Sigrist said. "They babble, though. It's adorable. I can't wait to get home to them. It's been over a week since I've seen them." Both players kept their opening hands. Sigrist won the roll and got things started with a Chalice for one on the first turn with the help of Simian Spirit Guide. Next came Spellskite off another Simian Spirit Guide, but Sigrist was stuck on just a Mutavault for lands. Sigrist makes the most of a lack of mana. Cuneo was attacking with Inkmoth Nexus, but he'd need to find some way to interact with Spellskite and Chalice of the Void if he wanted to present any sort of reasonable clock. Eye of Ugin came off the top of his deck, and Matter Reshaper meant that Sigrist could start attacking. Cuneo had a plan of his own. Dismember dealt with Spellskite and Viridian Corrupter destroyed Chalice of the Void. Suddenly, Cuneo had gone from being in an awkwardly bad situation to being in a somewhat dominant position. Eldrazi Mimic came down for Sigrist. Unfortunately, his struggle to find a third land was proving to be a serious problem. Cuneo went for Become Immense and Sigrist tried to use Dismember to prevent getting killed in a single shot. Cuneo had Vines of Vastwood to protect the targeted Viridian Corrupter, though, and they were on to the next one. Cuneo is no stranger to the feature match area. Both players kept their hands in the second game. Once again, Sigrist led things off with a Chalice for one. Cuneo looked to be struggling under the Chalice as he missed his second land drop. Sigrist had a pair of 2/2 Endless One and was repeatedly sending them into the combat as Cuneo spent turn after turn discarding. Four or five turns went by like this until Cuneo deadpanned, "Good game." They both laughed and moved on to the last game of the match. "Now, I get to play first," said Cuneo. "So you should probably take those Chalice of the Voids out of your deck." "You think?" replied Sigrist, knowing that Cuneo was obviously joking. 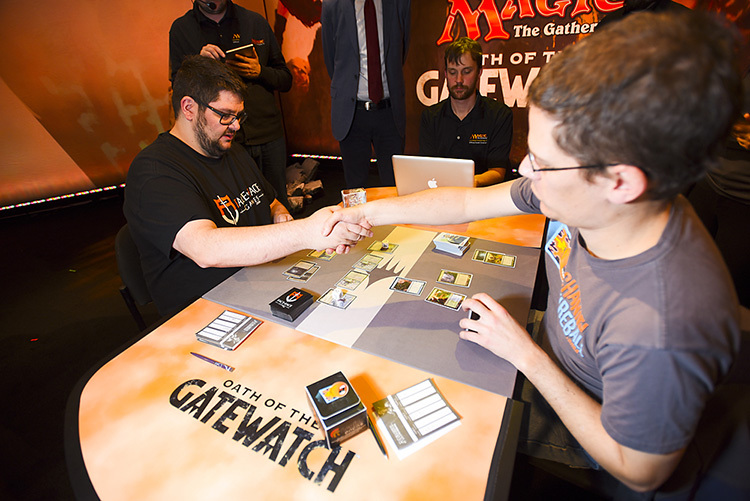 Sigrist kept his opener, and Cuneo went to six cards before finding an acceptable grip. Cuneo got things started with Blighted Agent on his second turn. Sigrist had a Chalice of the Void for one, but Cuneo was already able to get in for two points of poison thanks to Blighted Agent and Inkmoth Nexus. The tides turned quickly as Sigrist played Reality Smasher on his third turn, which immediately started smashing Cuneo to pieces. Cuneo ran Noble Hierarch into Chalice of the Void, perhaps to fill his graveyard for Become Immense. Reality got even more smashed as Sigrist cast a second copy of Reality Smasher along with Endless One for two. Cuneo revealed the lethal Become Immense that was stuck in his hand and extended his hand in defeat. Unable to withstand dual Smashers, Cuneo extended the hand.